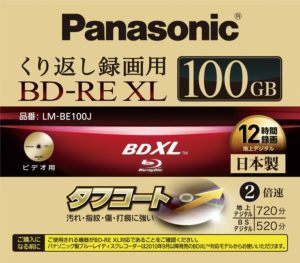 Besides M-Disc also all other current optical media are supported, which means CD-R (48x), CD-RW (48x), DVD±R (16x), DVD±R DL (8x), DVD±RW (8x), DVD-RAM (12x), BD-R (6x) and BD-RE (2x). Compared to DVD recorders the drive looks a bit more “classy” with its shiny metallic LG logo and a front which resembles brushed alloy (although it’s made of plastic). Older 3x DVD-RAM media can also be read and written. The drive works very quiet even at higher speeds. Reading audio CDs works fast and flawless. For testing purposes I also purchased a 2x BD-RE media with a capacity of 25 GB by Verbatim to get an impression how good (or bad) this works in practise. 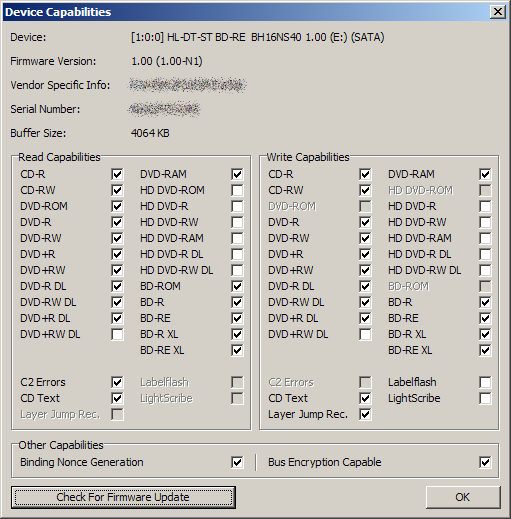 Since BD drives are directly supprted by Windows 7 there is no additional software neccessary to use BD-RE as a rewritable media. The media was formatted with UDF 2.50 in Windows 7. Theoretically 2x BD-RE should allow a transfer rate of 9 MB/s. In practise this looks different due to use of packet writing – a test backup of about 14 GB of data with many single files using robocopy took about one hour, which means less than 4 MB/s. Therefore external hard discs or systems like RDX are clearly more efficient for regular backups. But another point was more severe: the media written this way was not readable any longer when I tried to update the data on it! I used robocopy with the option /MIR – at the beginning everything worked fine. But after a while robocopy started to report CRC errors and eventually the media was not readable at all! So I did a second test with ImgBurn, which also supports Blu-ray. With this software the media was erased once and then written in the “conventional” way. On one hand the process was faster (about 40 minutes instead of an hour) and also copying the data back was significantly faster (about 20 minutes, which equates to 4x BD). Therefore I will use BD-RE only this way. The durability of BD-RE media is stated at 30-50 years, so it should generally be suitable for long term archival storage of data. I have device in use now for about 18 months and fortunately there where no bad surprises as I experienced it with the LG GH24NS90. Recording of DVD±R, M-Disc and BD-RE as well as reading all kind of media (DVD, DVD±R/RW, DVD-RAM, BD, M-Disc) still works without any problems.